Fourth Row Center: Film Writings by Jason Bailey: Cassavetes: "Opening Night"
Hey, remember when I was working my way through all the Cassavetes movies? Yeah, I’m gonna finish that now. There’s a scene in Opening Night where Gena Rowlands stares at herself in a mirror, for a very long time. As she does, she begins to see herself, really see herself, but also to see the girl—the young autograph seeker who she met a few nights before, right before the girl was killed in a car accident. You could say things have been strange for her since then. 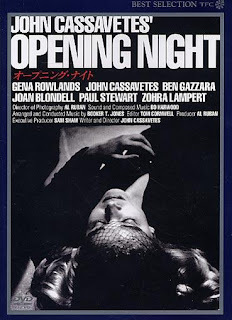 Cassavetes barely managed to release Opening Night in 1977. His previous film, The Killing of a Chinese Bookie, had flopped and tapped out his film-to-film self-distribution funds; it was, in many respects, re-discovered in the early 1990s, after its director’s untimely death. As Bookie was a uniquely personal riff on the gangster movie, Opening Night is his take on an even moldier genre, the backstage story. But Cassavetes brings an actor’s grace and insight to the tale, which captures the matter-of-fact nature of those impossibly close and personal inter-company relationships. Rowlands is (no surprise) marvelous; the character of Myrtle Gordon a more glamorous but no less damaged version of Mabel Longhetti in A Woman Under the Influence. An early scene, in which her director (Ben Gazzara) and co-star (Cassavetes) attempt to rehearse a stage slap, is as potent and concise an examination of actorly neurosis as I can recall; her desperate visit to that co-star’s door late in the film is a heartbreaking moment of truth laid bare. Opening Night shares the flaws of most of the director’s filmography—it’s too damned long (144 minutes), there are scenes that don’t work (like her visit to a spiritualist), and the score is just intolerable. We also spend too much time looking at the stage, even for a film about theatrical types, though the sequence of a performance going completely off the rails is compulsively watchable, and the seemingly uncinematic conclusion (we really do spend the last twenty minutes or so watching a play) somehow works. It’s got its problems, as all of his films do. But it’s kind of perfect just as it is. On DVD: "The House of the Devil"
Oh, No Way I'm Seeing That: "Killers"
In Theaters: "The Good Guy"